Checked out MN 1 through the 103 miles from US 53 to MN 61 yesterday. The elevation east of Ely is actually surprisingly high, I was showing between 2,000-2,100 for a large portion of those 60 miles to MN 61. Does anyone know if there was ever some far flung plan to get MN 169 as far east as what would have been US 61? No, in no small part because the Boundary Waters Canoe Area (a restricted area) is in the way. Also of note is that the MN 169 segment east of Ely was originally designated MN 221. If I recall, part of the section of MN 1 between US 53 and MN 169 was unpaved as recently as the mid-90s. MnDOT and St. Louis County then did a road swap to get MN 1 onto a paved road. But wasn't established as a wilderness preserve in the 1970s while the creation of MN 169 occurred in 1934 with US 169 being truncated to Virginia? It seems odd even for the time period to have a state route extension of a US Highway go all the way to something like 1 only to stop. At the time weren't the steel mills kind of more less going much more strong out in the iron range in places like Soudan and Ely? 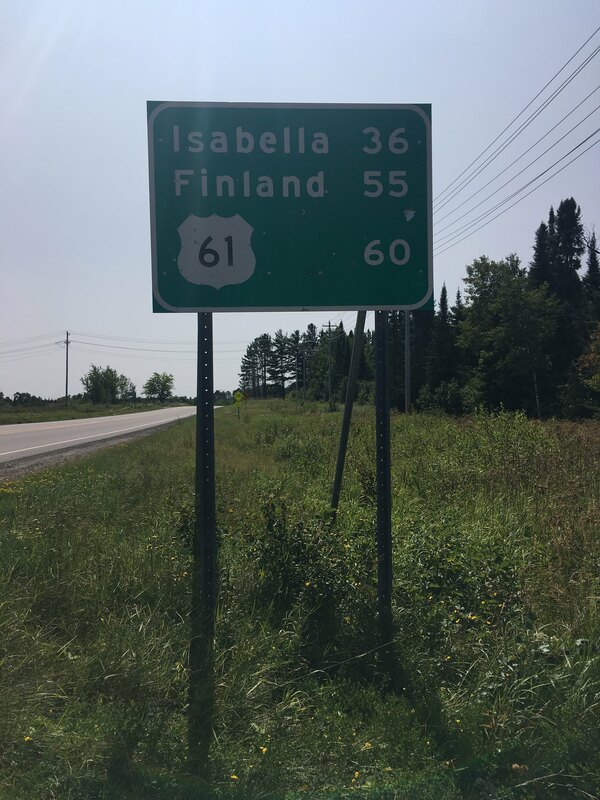 Wasn't US 61 routed far more inland to the Canadian border at the time instead of ending near Grand Portage? 61 was routed more inland but it was only about 12 miles upstream from where it is now. A large part of the reason for the relocation to the modern Pigeon River crossing was the push for it by the Grand Portage reservation government. Huh, somehow I never knew this before. When was it relocated? 3) By the time the MN 169 number replaced the MN 221 number east of Ely the plan had been dead for two decades. The protection of the Boundary Water Canoe Area has been controversial since the early 1900s. In the 1926 the "roadless area" was created but as a compromise excluded two corridors where there was strong local advocacy for future roads were proposed for tourism and economic development. One of these was the "Ely-Buyick Road", and one was an east-west road that would have linked up to the Gunflint Trail, the "Ely-Gunflint Road" As a compromise the Ely-Buyick Road, now the Echo Trail, was built and the westernmost portion only of the Ely Gunflint Road was built as the Fernberg trail, which covered most of the area that was then populated. In 1930 the Shipstead-Nolan act annexed the remainder of the corridor into the roadless area. Also there never were steel mills on the range. Ore got put into trains and then transported via train to Lake Superior where it got loaded onto ore boats to go to the mills in the lower midwest. It was relocated between about 1961 and 1965 in two stages. The new border crossing opened first in 1963, with US 61 then using Cook County 17/Mineral Center Road as a temp connection between old 61 and modern 61. 1996. The old MN 1 alignment that was unpaved is now CR 361. The protection of the Boundary Water Canoe Area has been controversial since the early 1900s. In the 1926 the "roadless area" was created but as a compromise excluded two corridors where there was strong local advocacy for future roads were proposed for tourism and economic development. One of these was the "Ely-Buyick Road", and one was an east-west road that would have linked up to the Gunflint Trail, the "Ely-Gunflint Road" As a compromise the Echo Trail was built and the westernmost portion only of the Ely Gunflint Road was built as the Fernberg trail, which covered most of the area that was then populated. In 1930 the Shipstead-Nolan act annexed the remainder of the corridor into the roadless area. Hell that answers pretty much all the questions I had. Usually there is some weird story about what "could have' been with strange alignments or numberings like that. Kind of strange to see an area of the Mid-West that essentially has zero development at all. Yep, the development stopped where the iron ore stopped. Pretty sure there are some photos of the old, upstream border crossing hanging on the wall in Rydens; the duty-free tourist store & restaurant just this side of the border.